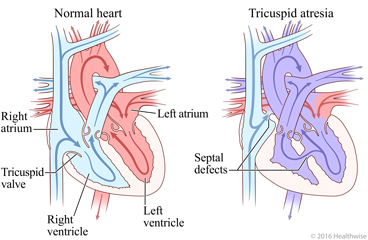 Tricuspid atresia (say "try-KUSS-pid uh-TREE-zhuh") is a type of congenital heart defect. Congenital heart defects are heart problems a baby is born with. These heart problems are usually diagnosed at or before birth. The heart is a muscular pump with four chambers. The two top chambers are the left atrium and right atrium. The two bottom chambers are the left ventricle and the right ventricle. Normally, blood flows from the right atrium into the right ventricle. The tricuspid valve between these two chambers keeps the blood moving forward and prevents backflow. "Atresia" means "not there." So in tricuspid atresia, the tricuspid valve isn't there. There is no opening. Blood does not flow through the heart as well as it should. The baby does not get the oxygen he or she needs. The lack of this valve can also cause other problems. The right ventricle usually doesn't develop well and is too small. The aorta and the pulmonary artery—the two main blood vessels leading to and from the heart—may also be too small. Most babies with this problem also have other heart defects, like an opening between the right and left sides of the heart. A fetal ultrasound, which lets your doctor see an image of your baby before birth, sometimes finds this defect. Your baby may get medicine that helps keep oxygen-rich blood flowing to the body. It is often given through a blood vessel in the belly button. Your baby will have surgery to help open the blood vessel that carries blood from the heart to the lungs. What the doctor does during surgery depends on how well blood is flowing through the heart and how small the right ventricle is. Your baby will be asleep during the surgery. Your baby will probably need more than one surgery. The surgeries may be done a few months apart. If your baby has trouble breathing, the doctor may use a ventilator. This machine helps your baby breathe. To use the machine, the doctor puts a soft tube through your baby's mouth into the windpipe. After surgery, your baby will need routine checkups to check on his or her heart. It's hard to be apart from your baby, especially when you worry about his or her condition. Know that the hospital staff is well prepared to care for babies with this condition. They will do everything they can to help. If you need it, get support from friends and family. Ask the hospital staff about counselling and support. Enter F732 in the search box to learn more about "Learning About Tricuspid Atresia in Newborns".